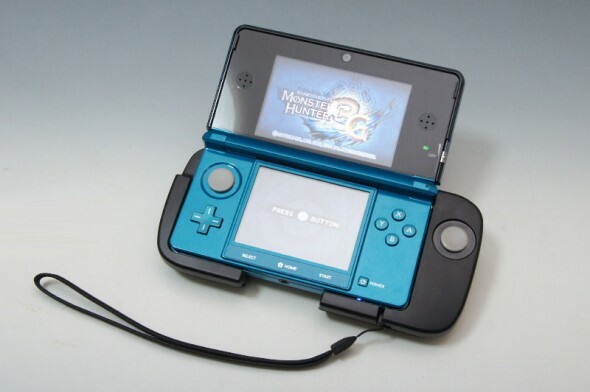 One of the criticisms that people had of the older Nintendo 3DS models was that they lacked a second analog stick, which is currently a standard for the major video game devices that are in the market. As an initial solution, Nintendo released the Circle Pad Pro accessory for both the original 3DS and the larger Nintendo 3DS XL models. The Circle Pad Pro accessory for the original Nintendo 3DS. I have several games in my collection that were compatible with the Circle Pad Pro, but this accessory isn’t an option for me because nobody made a version of it that was compatible with my original 3DS handheld device, the Nintendo 2DS. But even if I did have a 3DS or a 3DS XL, the Circle Pad Pro had other issues – it needed a separate battery as a power supply, it made the device bulkier and less portable, and it blocked the cartridge slot (you’d have to remove the accessory before you can swap cartridges). Thats why, out of all the new features and improvements that the New Nintendo 3DS XL had, I was really excited about the C-Stick. The C-Stick is Nintendo’s new solution to the demand for a second analog stick. Located just above the face buttons of the device, it’s more of a small nub than an actual analog stick. 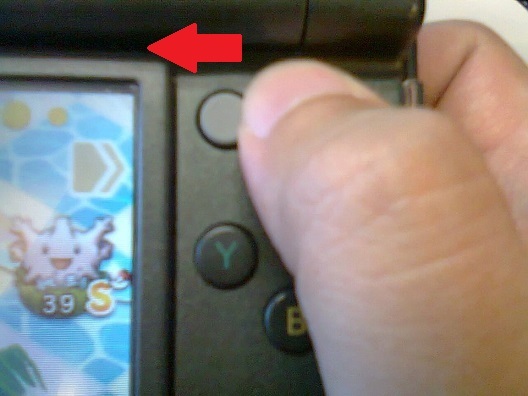 The C-Stick feature is one of the selling points of the New Nintendo 3DS. When I first saw the C-Stick in ads and product announcements, I immediately thought of pointing sticks that are used by some laptop models in place of or together with touchpads. 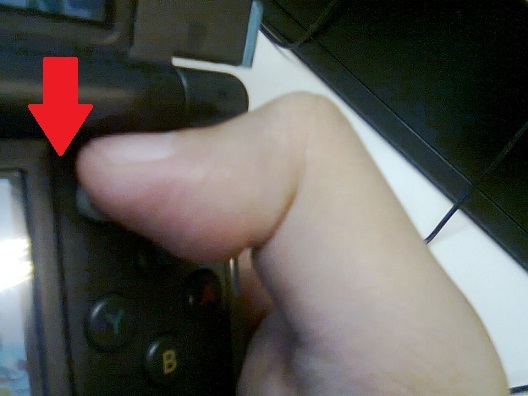 So when I finally got my hands on the New Nintendo 3DS XL, I assumed that the C-Stick worked in the same way that pointing sticks did. Do you see any similarities between the two control options? Nudging the C-Stick to the left doesn’t offer a good degree of control. Nudging the C-Stick downwards is much harder because you’d have to “hook” it with your thumb. Because of this, I was disappointed in the C-Stick. I hoped that I would be able to play Metal Gear Solid 3D: Snake Eater better, but this kind of controls for a game that requires precision aiming just wouldn’t work. If I overshoot and veer too far to the left, I’d have to move my thumb to the opposite side of the C-Stick in order to go back. Workable for camera controls, but really not viable for aiming. Just in case the image doesn’t load correctly, here’s how you do it – don’t nudge the C-Stick towards the direction that you want. If you want to go right, press the right side of the face of the C-Stick. 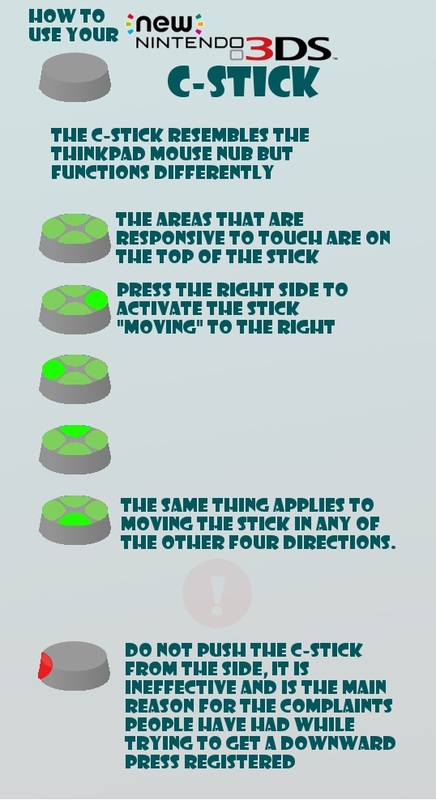 If you want to look down, press the lower part of the face of the C-Stick. So essentially, the C-Stick functions more like a smaller D-Pad that’s shaped like a circle instead of a plus. I wanted to create my own images, but Mechageo’s version really says everything that you need to know about using the C-Stick. And you know what? He got it right! I’ve used the C-Stick in the way that he described it, and it works perfectly. Aiming certainly became easier and more accurate in a third-person shooter like IronFall: Invasion, and I’m able to execute C-Stick Smash attacks in the 3DS version of Super Smash Bros. much more reliably. The New Nintendo 3DS XL has been out all across the world since February 2015 (and was released in Japan and Australia much earlier), so I’m quite surprised at how there aren’t any guides (aside from Mechageo’s Reddit thread and two videos on Youtube) on how the C-Stick is used. I’m even more shocked to see a lot of people who are still using the C-Stick incorrectly, which is why I’m writing this. You can’t enjoy a video game fully if its controls aren’t working well, and the C-Stick actually works fine IF used properly. Again, I was disappointed with the C-Stick feature initially. If it weren’t for Mechageo’s infographic, I still wouldn’t have known how I should use the C-Stick and I’d probably still be disappointed with it. So, big thanks to Mechageo for enlightening me on this! What do you think about the C-Stick? Did you have the same problems as I did? Feel free to drop us a line or two below.